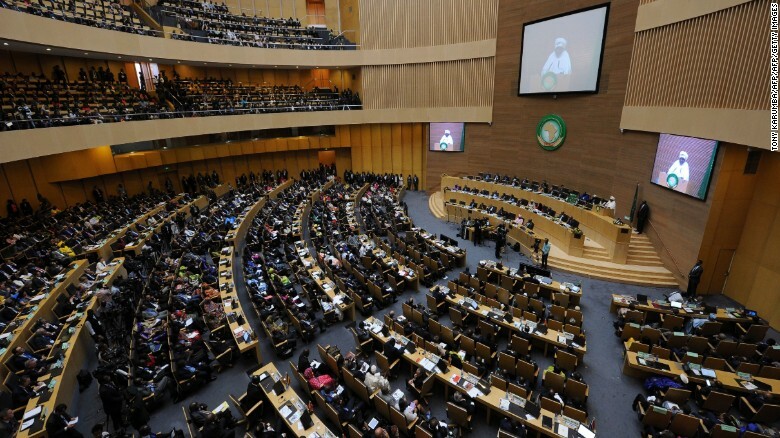 As the European Union threatens to unravel in the wake of Britain's vote to leave, the African Union is pursuing a path of closer integration through the launch of a common passport that will grant visa-free access to all 54 member states. The electronic passports will be unveiled at the AU summit in Kigali, Rwanda, later this month, where they will be issued to heads of state and senior officials. The Union aims to distribute them to all African citizens by 2018. "This flagship project has the specific aim of facilitating free movement of persons, goods and services around the continent - in order to foster intra-Africa trade, integration and socio-economic development," the Union announced in a statement. The passports represent a key plank of the Agenda 2063 action plan, which emphasizes the need for greater continental integration, drawing on the popular vision of Pan-African unity. Freedom of movement has been a longstanding priority among member states, as enshrined in previous agreements such as the 1991 Abuja Treaty. Common passports have already been adopted for several regions, such as the Economic Community of West African States (ECOWAS). Currently, just 13 African states are open to all African citizens without advance visas, with many placing severe restrictions on travel. A recent report from the African Development Bank advised that easing entrance requirements would support economic growth, citing the case of Rwanda, which saw GDP and tourism revenues climb after abolishing visas. AU Director for Political Affairs Dr. Khabele Matlosa believes opening borders will have a profound effect for workers at the lower end of the scale. "We have a problem now that young people are risking their lives to cross the Sahara Desert or travel on boats to Europe," says Matlosa. "If we open opportunities in Africa we reduce that risk." The Director has been studying the example of Europe, but believes a closer African Union will not be so threatened by concerns about immigration or loss of sovereignty. "Africa is a continent of migrants so we are not as suspicious of refugees," he says. "This is a test of our Pan-Africanism, the doctrine which underpins the African Union's existence. We are committed to this philosophy." However Matlosa acknowledges the target of providing all citizens with the passports by 2018 is ambitious, conceding that full coverage may not be achieved until several years later. Analysts have highlighted logistical challenges of the initiative. "Not all countries have the same level of technology needed for the biometric system and to register their citizens," says David Zounmenou, senior research fellow at the Institute for Security Studies. "The timeframe is too short -- 2020 would be a fine effort." Zounmenou adds that the closer union will face a complaint familiar to European counterparts -- that of more powerful states overriding smaller members. "Not every country will buy into it," he says. "Visa revenue is an important source of income for some countries and removing it will affect the local economy unless there is compensation." But Zounmenou believes that common passports will support international trade within the continent, reducing the widespread dependence on Western goods, and offer new opportunities to many citizens. "Many people ask 'what are the practical benefits of being a member of the AU?'" he says. "This can be one of the most important social and economic responses, which allows business to flow, students to travel, and people to move from one corner of the continent to another." Critics have suggested open borders risk strengthening terror groups and organized crime, but Zounmenou disagrees. "One key advantage is that we will have centralized records to show who is going where," he says.